Okay, everyone, don't laugh at me...when I was at BINGO the other night (I only do it once in awhile and it was for Christmas baskets), I had an idea! 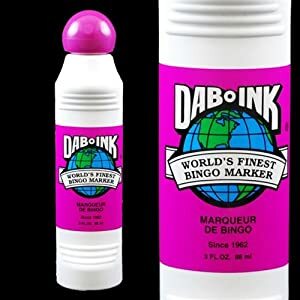 I always use BINGO daubers to mark student agendas in red, yellow, or green according to their daily behavior. However, I have never used them for anything else in class. Then it hit me! I could use them to have the students STAMP their Word Wall Words! So, I got out these and some letter stamps and set up three centers in my classroom. I taped bulletin board paper across the tables and let the students go to town! They did not make a peep the whole thirty minutes! They stamped and spelled and have been asking to do it every day since! My friend, Sharon, is making some printable words for early learners to use with the BINGO daubers and I will be sure to pass along the link to that when it becomes available. Try it and see what you think! Also, comment if you have any other ideas for how to use these in class. I've seen them used for stamping out names, stamping words, art time, etc. Many uses and the Dollar Tree had them recently (don't know if they still do). These are so useful, aren't they? I just recently used them to make flash cards for math!